Ontario has gone four months without a confirmed case of PED. Now is the time to maintain strict on-farm biosecurity protocols to prevent PED infection in your pigs. If you suspect that your pigs may be infected with PED virus, contact your veterinarian immediately. He or she will provide strategies to help you to manage the disease. Be vigilant and watch for early signs of scouring. 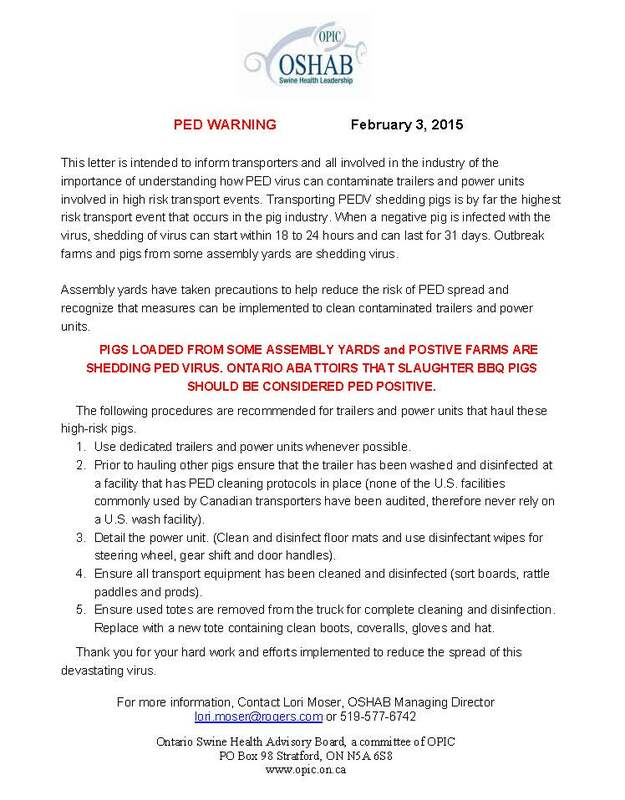 Reposted from an Ontario Pork Industry Council E-notice. A new PED case was diagnosed in Ontario Dec 8, 2014. The case was diagnosed at an all in/all out finishing barn in Oxford County. This case is related to the Niagara case diagnosed December 2nd. The producer and his veterinarian immediately implemented a control and elimination plan for the farm and have arranged for orderly marketing to reduce risks to the industry. They are participating in the OSHAB PED ARC&E and have notified key service providers. The PEDV infection in this barn was introduced from a PEDV contaminated trailer. Earlier in the day, a cleaned and disinfected trailer picked up market hogs at another finisher barn within this production system in the Niagara area. After delivering market hogs to the processing plant, the back end of the trailer was scraped forward into the belly and the rear compartment was disinfected. This scraped and disinfected trailer was then used to pick up an additional load of market hogs at this barn in Oxford County. The Niagara area barn was diagnosed with PED the next day. There are no other related sites with suspect signs and all related sites has tested negative. The production system is assessing risk reduction transportation strategies. Please review your biosecurity procedures on farm and consider your transport protocols. Our thanks to the producer for his rapid response and transparency as we work together as an industry to control and eliminate PED cases in Ontario this fall and winter. As a new case of PED is reported in Ontario, now is a good time to review your biosecurity procedures. Visit Ontario.ca/swine for a listing of biosecurity resources. A new PED case was diagnosed in Ontario Dec 2, 2014. The case was diagnosed at an all in/all out finishing barn in the Niagara region. The producer and his veterinarian have developed a control and elimination plan for the farm, are participating in the OSHAB PED ARC&E and have notified key service providers. Please review your biosecurity procedures on farm. We will be automatically dialing out to our provincial producers and others who have registered for the event and have provided us with their phone numbers. Please note only direct or mobile phone numbers will be accepted. Ensure all incoming pigs are from a PED negative farm. Follow and enforce proper entry protocols. Dedicated barn boots and coveralls must be available for all staff and visitors. Use a Danish Entry System that allows for unidirectional flow of staff and visitors entering the barn. A hand wash or hand sanitizer should be available upon entry. If using deadstock pickup, ensure carcasses are picked up off-site. Wash and disinfect equipment used to transfer carcasses from barn to deadstock bin. Ensure transporters are following your farm’s protocol for trailer sanitation. A washed and disinfected trailer will reduce the risk of disease transmission to your farm. Refer to ‘Cold Weather Trailer Disinfection Procedures’ available from OPIC. Communicate biosecurity protocols to any service providers visiting your farm. Refer to the National Swine Farm-level Biosecurity Standard and discuss your biosecurity plan with your veterinarian. Monitor your herd for clinical signs of the disease, particularly vomiting and diarrhea. Call your veterinarian immediately with any concerns. They will advise you on what to do next. Information on PED, including links to biosecurity protocols, and other best practices related to deadstock and manure handling, etc., are available at www.Ontario.ca/swine. You can also subscribe to this blog and follow @ONswineinfo on Twitter for updates and links to resources. This virus is very persistent and easily travels with snow and slush. It will require a dedicated effort to keep this one under control, and off your farm, over the coming winter. A new PED case has been diagnosed in Ontario. This is the first new case diagnosed in Ontario since July. Clinical signs were seen at a farrow to finish farm in Middlesex Monday November 10th. Samples were taken Monday evening and laboratory confirmation was received November 12th. The most significant risk factor for this farm was pig transport. The producer and his veterinarian have developed a control and elimination plan for the farm and have notified key service providers. 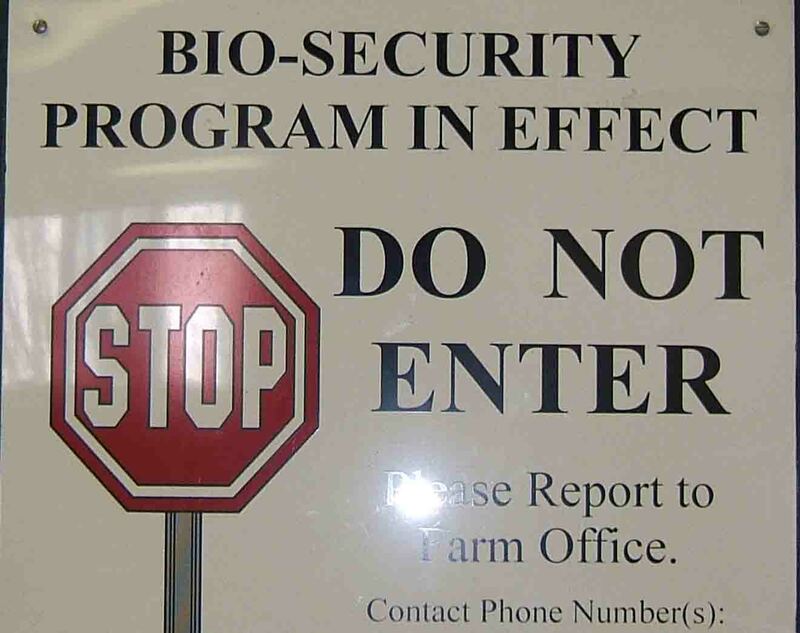 Please review your biosecurity procedures on farm. Use of unwashed trucks is a significant risk for PEDV transmission. Cold Weather Trailer Disinfection Procedures provides details about proper trailer disinfection.